Landless farmers, in Indonesia and Malaysia, fear they will suffer if tropical countries get cash to save forests. Just before his last birthday Prince Charles, Britain’s future King visited the Harapan forest in Jambi on the island of Sumatra and planted an ironwood sapling, a fitting symbol of his wish to be remembered for saving the rainforests. Covering 101,000 hectares of degraded lowland forests in South Sumatra and Jambi provinces, Harapan, which means hope, is the latest forest to be endorsed by the prince’s Rainforest Project. It mirrors the prince’s twin visions of halting deforestation and mitigating climate change. The Indonesian government has granted a concession to manage the restoration of the forest to a consortium of three non-governmental organisations. A local group Burung Indonesia, the UK’s Royal Society for the Protection of Birds (RSPB), and BirdLife International formed a group called PT Restorasi Ekosistem Indonesia, known as PT REKI. Dieter Hoffmann of BirdLife International expects the trees to absorb up to five million tonnes of carbon annually, equivalent to the annual emissions of the UK city of Manchester. To finance the project, it plans to raise money from the carbon offset market by trading in carbon credits generated from the restoration of the forest. The money will go towards buying seedlings and employing workers to plant them. But this optimism is not universally shared. The forest restoration project has angered landless farmers who say they were evicted from forest land now being managed by PT REKI. A month after Prince Charles planted his sapling, Sarwadi Sukiman, a small farmer from Sumatra, appeared in the Polish city of Poznan for the December 2008 United Nations climate change conference with a farmers’ pressure group, Via Campesina. They came to lobby against the project. Sarwadi comes from Tanjung Lebar village in a rural area that saw large-scale commercial logging in the 1980s.When the companies left in 2002 he said peasant farmers and indigenous people reclaimed the land to grow rice, beans and fruit. 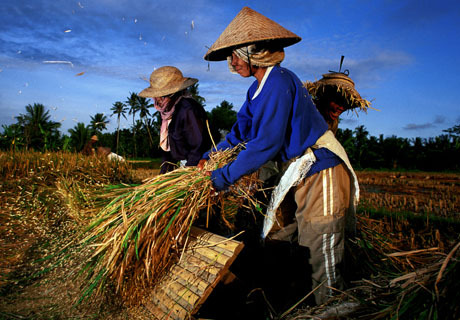 About 1,500 families, organised under the Indonesian Peasants’ Union occupied and cultivated a large area. Sarwadi said villagers were evicted after PT REKI took possession of the area in 2007, “We were forced to sign a letter promising to never come back again. Some peasants were jailed, though they were later released. One of them was detained for six months for defending his community’s land,” he said. In response to this allegation, PT REKI consortium has accused Via Campesina of distorting the situation on the ground. When asked about the evictions described by Mr Sarwadi, an RSPB spokesman said PT REKI had reported the presence of “illegal loggers” to the Indonesian police, “as required under Indonesian law. We are also discussing how Harapan rainforest can support the development of these communities,” he said, “It has already created employment opportunities for over 100 locals.” He added that PT REKI is helping around 500 indigenous Bathin Sembilan people to secure legal land tenure. The row over Harapan is interesting in light of the UN’s efforts to reward governments in tropical countries for protecting their rainforests. The UN has adopted the principles of a scheme called Reducing Emissions from Deforestation in Developing countries (REDD) with the support of a majority of the 192 UNFCCC member governments. In short, the REDD scheme will ensure funds go to governments who preserve their native forests. The Harapan project was not set up as a REDD initiative, but provides an early example of how future REDD schemes might work. It also exposes the potential for conflict between globally agreed environmental initiatives and the interests of landless rural and indigenous communities. Friends of the Earth International, which is campaigning to keep REDD out of the carbon market, says any proposal that increases the value of the forests may worsen land rights abuses in countries which do not recognise indigenous rights. The REDD negotiating text is scheduled to be finalised at the next meeting in Copenhagen in December 2009. Moves to include indigenous rights have so far been thwarted by opposition from the US, Australia, New Zealand and Canada, countries that refuse to ratify the UN Declaration of the Rights of Indigenous Peoples. Concern about REDD is not confined to Indonesia. In Malaysia industrial logging, particularly in the two states of Sabah and Sarawak on Borneo, has long been criticised for its unresolved land-grab conflicts which have impoverished indigenous communities. In Sarawak alone, a majority of the nearly 200 outstanding land dispute cases filed by indigenous communities are related to oil palm and forest plantation development that has encroached into what they claim as ancestral land. The Indigenous Peoples’ Network of Malaysia is concerned that the plantation forest scheme currently promoted by the government will mean clear-felling and will further concentrate control of the land in the hands of a few powerful, politically-linked timber companies. “Since most of our land is not titled, it will be very easy for the government to designate areas within our territories for REDD schemes… we will lose but they will make lots of money from these deals,” said Adrian Lasimbang, the president of the Network. Carbon offsetting is a financial instrument developed under the Kyoto Protocol that allows companies and governments of industrialised nations to meet their mandatory reduction targets by purchasing credits made available through avoided carbon emissions (like reforestation) in developing countries. Because of the rigorous registration procedures under the Kyoto Protocol, many projects have developed outside of the Protocol’s framework creating an informal ‘voluntary offset sector’ within which this project falls.